You know, there are actually some people that eat Boston baked beans for breakfast living in Boston? Why not? While you are visiting Boston you will find people eating all sorts of things for breakfast. 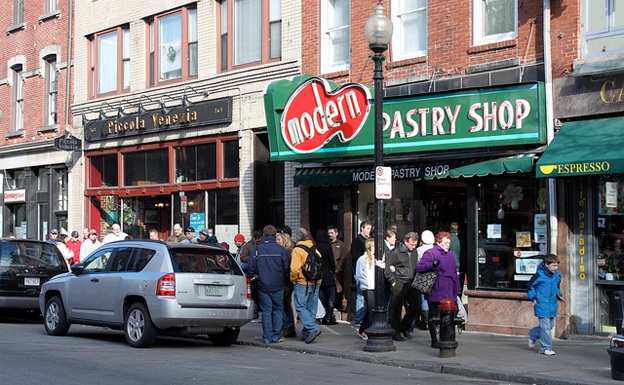 Modern Pastry in the North End normally has lines down the street at all times of day. But at breakfast, and on the weekends, the lines are especially long because many believe that Modern makes the very best cannoli. A typical breakfast crowd at Modern will be having espresso or cappuccino and a plate of cannolis. Mike & Patty’s is squeezed into a small storefront. Inside, order from the blackboard specials. They have everything. Croque Madame. Fried green tomato BLT. Bacon and egg sandwiches. Muesli with dried fruit and walnuts. American coffee. It is a one size fit all kind of place where you are sure to find what you are in the mood for. 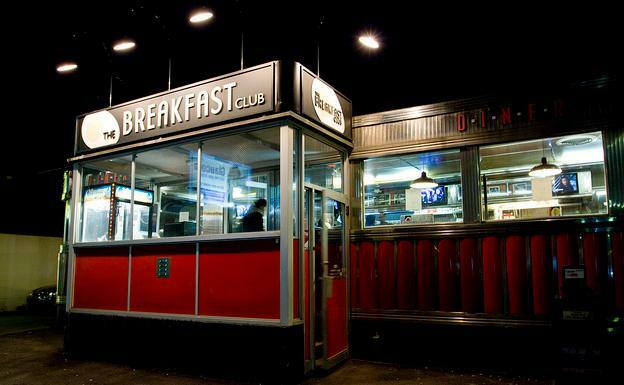 The Breakfast Club shines for breakfast. It is a big diner with an ample parking lot in the Alston neighborhood. Try the pumpkin pancakes, strawberry milkshake, and something called the Basket Case: fried eggs, pancakes, and bacon all in a basket. It draws crowds for brunch and weekend breakfast. L.A. Burdick in Cambridge is a winner for anything chocolate. You will see lots of people leaving the store with a paper cup you would think is their morning coffee but instead it is Burdick’s dark, rich, thick hot chocolate you can stand a spoon up in. There undoubtedly is an even greater caffein rush from their dark hot chocolate than from a cup of coffee! 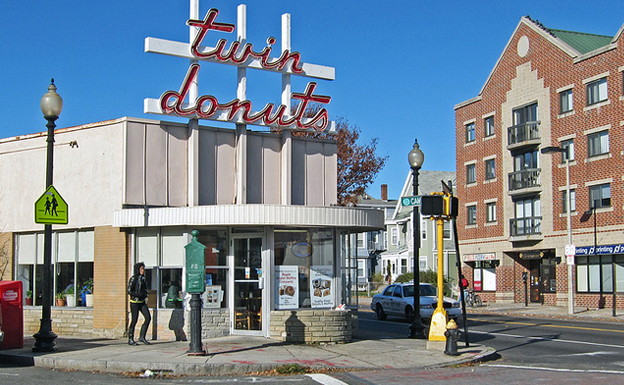 Twin DO-nuts serves breakfast all day. It is retro chic and fun. 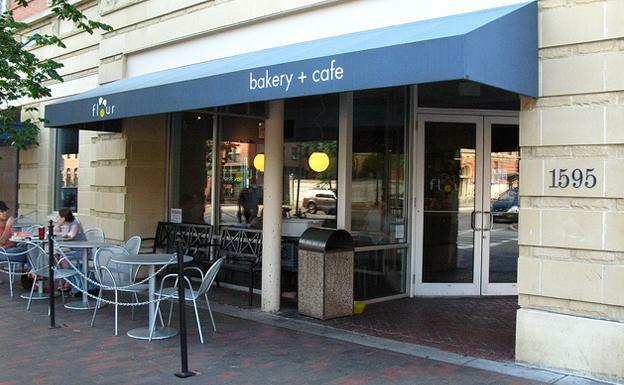 Try their raspberry chocolate coffee, great doughnuts, croissants, and omelettes. If you develop a favoritism for one kind of doughnut you may have to get there really early because they have been known to be sold out before 7 AM on some flavors! Rosticeria Cancun serves Mexican breakfast burritos, eggs with fried platains, and Mexican coffee. It makes a nice change from an American breakfast. Flour Bakery has become famous and foodies flock there each morning for the fresh sticky buns coming hot out of the oven. Then they order any of the freshly made sandwiches and coffee for their breakfast. Sticky bun first. Breakfast second! The Friendly Toast has been a breakfast hangout for dozens of years for Harvard and MIT students. Try the amazing Almond Joy pancakes, sweet potato fries, toasted cayenne cheddar toast, and well, just about anything else because everything is super delicious. Alex the author of “The best places for breakfast in Boston” loves to write about travelling and touring around the great cities in America. He also writes full time for a number of News websites in Boston.